I am a big fan of Oliver Reed and also a big fan of swordfighting and Renaissance garb. The Three Musketeers trilogy was just about a perfect set of movies for me! Click on each movie to learn more about it and to see images from the movie. Filmed in 1973, the one that began it all. The book was actually split into two movies to fit all the plot! This is the first half of the book. An amazing, star-studded cast, great attention to detail and it's funny to boot! This one was actually filmed back to back with the first movie, and was released in 1975. 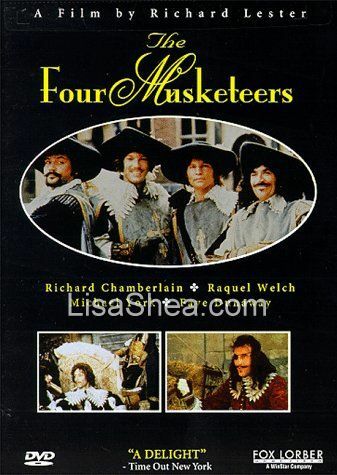 It features the same great cast and finishes up the story from the book "The Three Musketeers". Filmed in 1989, this movie is based on the Alexandre Dumas book "Twenty Years After". As the title might suggest, this book takes place 20 years after the events in the original books. The characters mention this every 5 minutes in case you've forgotten it :) The original cast is gathered together again!